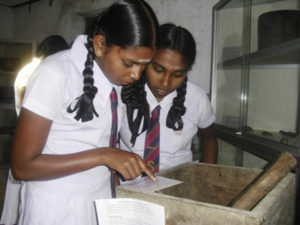 The Institute of Social Development (ISD) created the Tea Plantation Workers Museum to enlighten the wider community about the lives of the tea plantation workers in Sri Lanka. Many of these workers first came as migrant laborers (either voluntary or coerced) from Tamil-speaking India in the 19th and early 20th century. Most plantation workers today come from this legacy. Their unique cultural and socio-economic identity has not been recognized, and they remain at the margins of larger Sri Lankan society. ISD works for the rights of the tea plantation community, and the museum’s mission is to protect and preserve the artifacts, traditional dance, drama, folklore, oral history, and literature of the tea plantation workers. As well, ISD aims to promote ethnic and cultural harmony by highlighting the economic contributions of the plantation community. The museum itself is located in a historic setting – a 100-year-old “line room,” a plantation worker dwelling.